Vital Notes for Nurses: Principles of Care is an essential guide for nursing students and newly qualified nurses. It provides a concise introduction to the essential principles of nursing care. It encourages nurses to examine the principles and evidence underlying nursing practice and equips them with a thorough understanding of the complexities of patient care in different environments of care. 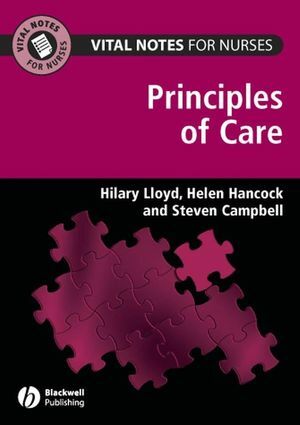 Principles of Care explores concepts of health and illness, conceptual frameworks for practice, principles of health care delivery, and professional standards. Key themes include assessment and planning, implementation and evaluation, patient education and health promotion, decision making and risk management, benchmarking, clinical effectiveness and practice development. Hilary Lloyd is Principal Lecturer in Nursing Practice Development and Research and Deputy Head of Nursing R and D; this is a joint post between City Hospitals Sunderland NHS Foundation Trust and Northumbria University. Helen Hancock is Postdoctoral Research Fellow in the Centre for Integrated Health Care Research, School for Health at Durham University. Steven Campbell is Head of Research and Development City Hospitals Sunderland NHS Foundation Trust and Chair of Nursing Practice, School of Health, Community and Education Studies, Northumbria University. '...a useful resource for clinical staff, laying great emphasis on the evidence base for current practice.